Diamond cluster pendants are either a single stone centre surround by a diamond cluster (melee) or a multistone pendant in a cluster. Art Deco diamond drop pendant, featuring 0.68cts of round brilliant cut diamonds across a decadent diamond drop necklace design. 3 free moving sections. Crafted in 18ct White Gold. 0.68cts diamonds. G colour VS1 clarity. 18" curb chain included. Arrives in Serendipity Diamonds presentation box. Matching earrings available to purchase separately. Elegantly styled, the Rosabella diamond hoop pendant features 3 free moving hoops, diamond set with 0.45cts of dazzling brilliant cut diamonds. Versatile Russian wedding ring set, comprising three pavé set bands in three colour 18ct Gold, set with brilliant cut diamonds and suspended from a simple curb chain. Three dazzling bands of 18ct White Gold, 18ct Yellow Gold and 18ct Rose Gold, pavé set with 2 carats of F VS brilliant cut diamonds, each band 2.7mm wide, suspended from a simple 18ct Gold curb chain. Customise this exceptionally stylish round diamond halo pendant, with your exact diamond quality, and metal choice. Choose your exact centre diamond. Choose from the carat weight, colour and clarity. We then provide an additional 0.15cts of round brilliant cut diamonds within the halo to match your diamond. 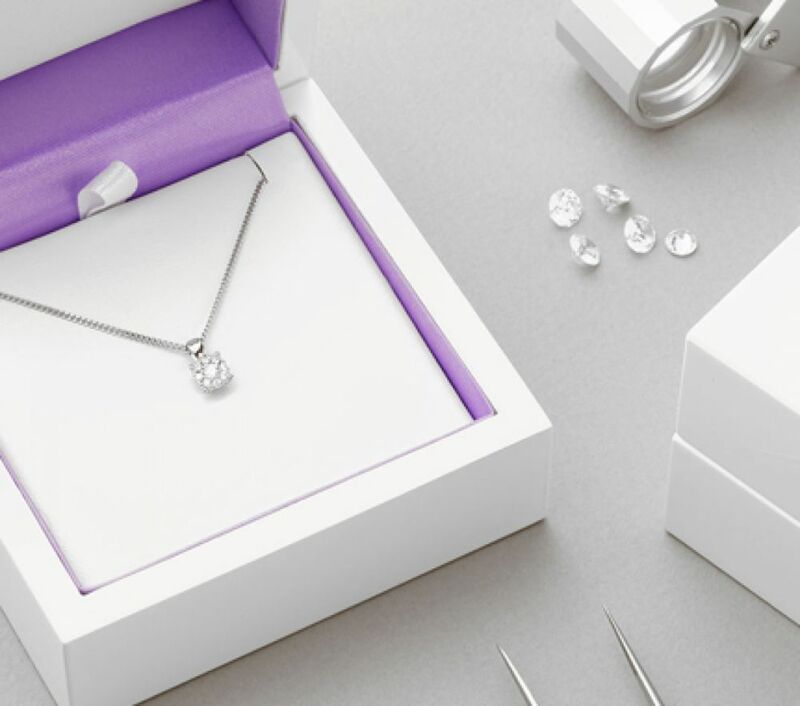 This elegant diamond pendant takes around 3-4 weeks to create and is shipped fully insured and beautifully packaged. 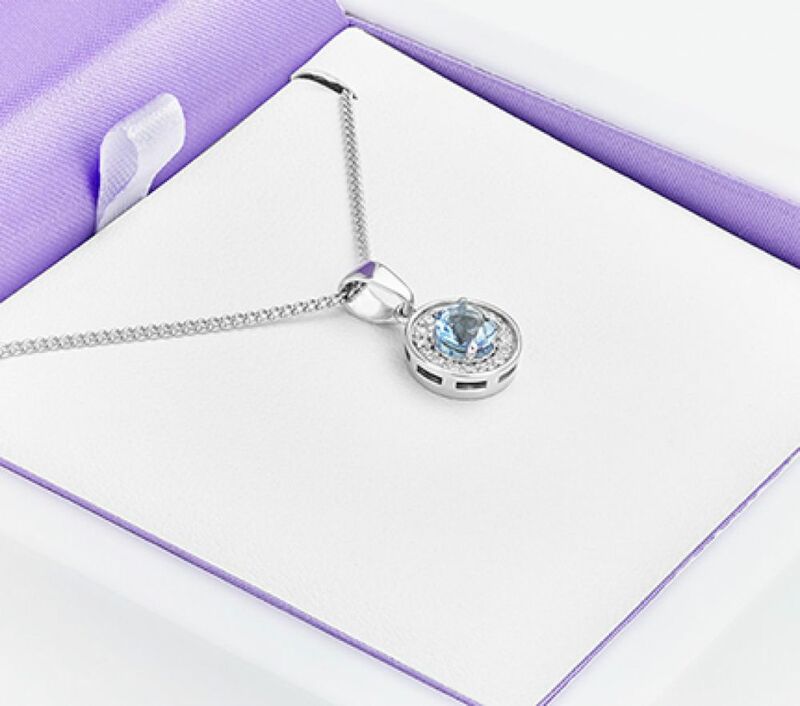 The Something Blue pendant makes the perfect gift for any bride. By tradition, give her something blue – beautifully styled with a blue Aquamarine, surrounded by a halo of diamonds, engraved on the reverse with a date or personal message. A beautifully modern, Princess cut diamond halo pendant, with compass orientation, set with a mixture of princess cut and round brilliant cut diamonds. Central square princess cut diamond. Choose your exact carat weight from our options to the right. We set an additional 0.20cts of round brilliant cut diamonds into the setting. This elegant modern pendant design benefits from movement created by the loose swinging bail and is supplied with a simple, curb chain 18 inches in length. This design is crafted within approx. 3 weeks. Dazzling Princess diamond halo pendant, combining a perfectly cut princess cut diamond with a square halo of outer round brilliant cut diamonds. Enjoy the movement and sparkle of this decadent Princess cut diamond halo necklace, handcrafted to perfection and delightfully presented. Select the carat, colour and clarity for your centre diamond. We set and additional 0.20cts of 1.3mm round brilliant cut diamonds within the outer halo. This pendant benefits from additional sparkle, created by the presence of a loose swinging bail allowing further movement of the design. Supplied with a luxurious, 18 inch curb chain in the metal of your choice. Please allow 3-4 weeks for completion. Elegant double halo diamond pendant, supplied fitted with chain, and available in a wide selection of options. Choose your central round brilliant cut diamond. Additional 0.25cts of outer diamonds grain set across the double halo design. Provided with 18 inch chain fitted, and available within 3-4 weeks made to order. We offer this design in a range of metal types, and sizes. A beautiful modern classic heart shaped diamond pendant set with round brilliant cut diamonds. 22 x 1.25mm round brilliant cut diamonds, held within grain settings. 0.25cts total diamond weight. G colour SI1 clarity. Elegant heart shaped design with loose swinging bail (loop) for chain attachment. Curb chain in 18" length included. Wood boxed. Gift packaged. Please allow 3 weeks for delivery. Magnificent, dazzling round brilliant cut diamond circle pendant, crafted with claw set diamonds accompanied by 18 inch chain. Choose between 2 different carat weight options. 0.60cts with 19 round 2mm diamonds or alternatively 1.20cts set with 19 2.5mm round brilliant cut diamonds. Claw settings and modern circle pendant design. Please allow 3 weeks for manufacture. Wood boxed and gift packaged. Gleaming 4 stone round diamond cluster pendant, adoringly crafted with matching round brilliant cut diamonds. 4 matching round brilliant cut diamonds. Drop style pendant design. Equally sized stones across a range of carat weight options. Beautifully white, eye clean diamonds. Includes 18 inch chain and free delivery. Elegant, 3 stone diamond cluster pendant, set with matching equally sized round brilliant cut diamonds in a very simple modern design. Three diamonds of equal size. Contemporary design. Supplied with 18 curb chain. Available in 18ct White Gold, 18ct Yellow Gold and Platinum. Choice of chain length if required. Approx 2-3 weeks for delivery. Beautifully packaged and delivered to your door. Captivating round diamond and blue sapphire halo pendant, set with a blue sapphire, surrounded by an outer halo of white diamonds. Central 5mm round brilliant blue sapphire, 0.65cts. Outer grain set diamonds, 0..20cts diamond weight. G colour VS1 clarity. 18 inch chain included. Approx. 3 weeks delivery. Supplied wood boxed and gift packaged. 18ct White Gold. Exquisite emerald cut diamond solitaire engagement ring, benefitting from the additional sparkle of a diamond set bail. This charming emerald cut diamond pendant, radiates glamour — luxuriously complemented by six beautifully matched round brilliant cut diamonds (adding 0.05cts to your chosen diamond.) Each commission combines subtle beauty with added sparkle. Your pendant is crafted to the specifications chosen, with the greatest care and attention to detail — presented with a simple curb chain, beautifully boxed and ready to wear.